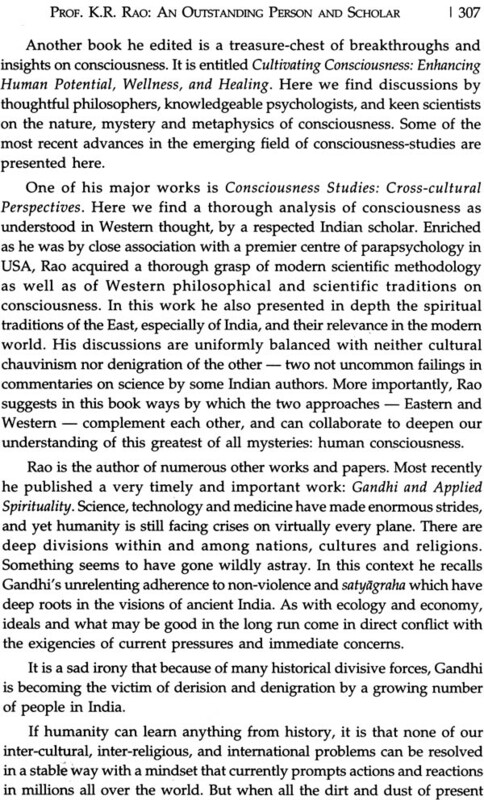 Consciousness, Gandhi and Yoga explores the cross-cultural and interdisciplinary Odyssey of K. Ramakrishna Rao spanning over a period of sixty years. Rao’s journey is a voyage of discovery of hidden treasures of consciousness in both the East and the West; and this volume is an authoritative sourcebook detailing and discussing that voyage by scholars from around the world. We find here reflections on the extensive contributions of K.R. Rao which contain a rare, and in some ways unique, blend of theory and empirical research, leadership and scholarship, and classical and contemporary perspectives of Eastern and Western thoughts in trans-disciplinary setting. Ramakrishna Rao has carried out extensive empirical research collecting data on hidden human potentials and is engaged in providing for them appropriate conceptual framework and theoretical base in cross-cultural consciousness studies. Further, he creatively anchors Gandhian thought and practices to the current developments in consciousness studies. The authors include Prof. Rao’s colleagues and contemporaries scattered around the globe and experts in consciousness studies, Gandhian thought, Yoga and parapsychology. They provide interesting insights into the life and work of Prof. Ramakrishna Rao. The present volume is offered as an academic tribute as Prof. Rao crosses the 80th milestone in life’s journey and completes sixty years of professional engagement as a teacher and researcher. Sambasiva Prasad, B. is currently the founding Director of GITAM Centre for Gandhian Studies. After a long career at Sri Venkateswara University, Tirupati, he was invited by the GITAM University, Visakhapatnam, and coordinated the ICPR-NCRI project on “The Application of Gandhian Ideas in the Ares of Peace, Conflict Resolution, Rural Development and Higher Education”. Prof. Prasad is the Executive Editor of GITAM Journal of Gandhian Studies and has been nominated by the Government of India as a member of the Indian Council of Philosophical Research (ICPR) in 2012 for a period of three years. 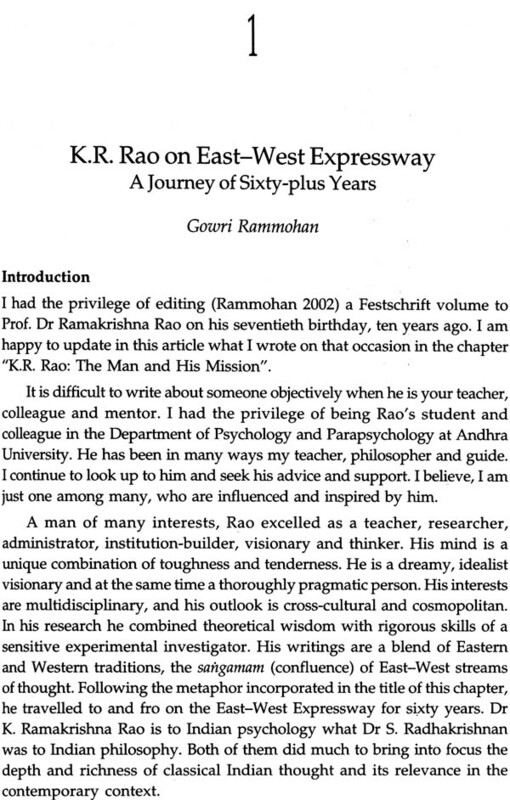 It is an honour to write Foreword to the Festschrift to be presented to Prof. K. Ramakrishna Rao on the occasion of his 80th Birthday. 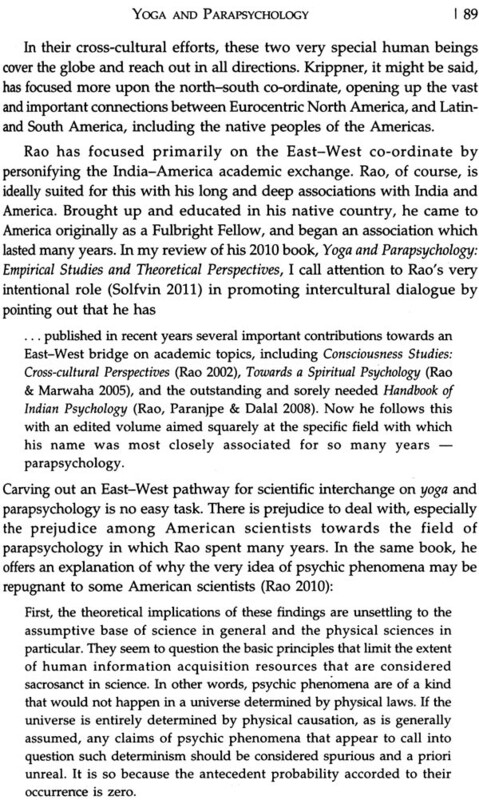 Rao’s signal contributions to the fields of philosophy and psychology as also a builder of institutions have been detailed by more than one contributor to this volume. In this short space, I can only outline what I have personally found most valuable in his varied and impressive oeuvre. As a psychologist, Prof. Rao was a pioneer in bringing into focus the vague feeling of many psychologists, especially in our country, that psychology as it is taught and practiced all over the world does not adequately reflect the full range of the inner experience of human beings and that Indian psychology has an important role to play in redressing this sense of unease. 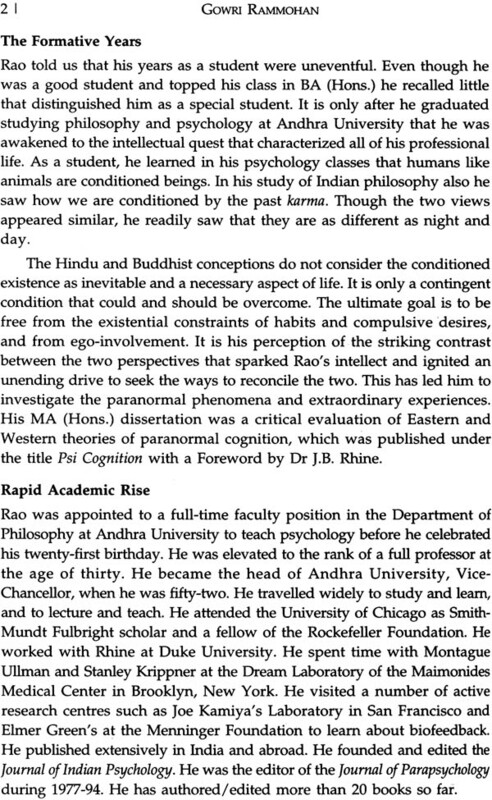 In a series of important publications, Prof. Rao has convincingly shown that at the present historical moment where we see a great fragmentation in psychological models and approaches, syncretic theorizing and a richness of ideological competition taking place, there is ample space for the emergence of an Indian psychology to stake a claim in the future development of the discipline of psychology. His has been the leading voice in warning Indian psychologists that if we miss this opportunity we might be condemned to eke out a ghetto existence at the margins of world psychology. 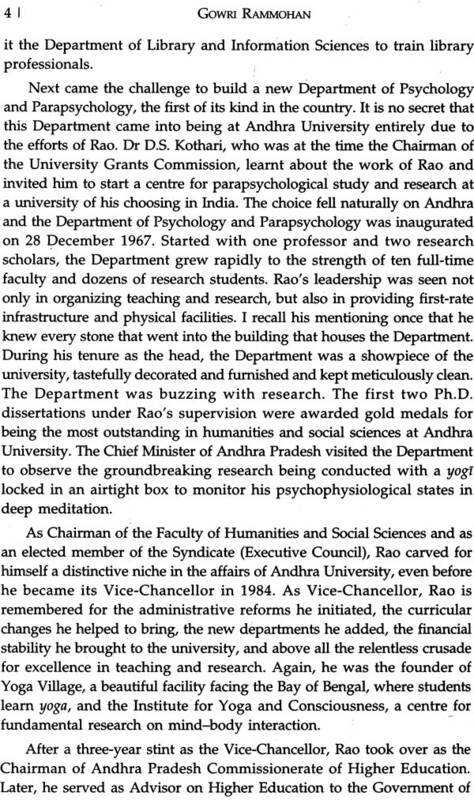 Prof. Rao, though, is much more than an eminent psychologist, philosopher or educationist. When an intellectual history of twentieth century India comes to be written, his name will occupy an honoured place as one of the few thinkers who did not uncritically accept the dominance of Western scientific discourse but creatively mined the Indian philosophical traditions to raise fundamental questions on the nature of consciousness and attempted to free our thinking from the stranglehold of modern Western discourse. He is thus part of a long line of thinkers, going back to the colonial era, who sought to salvage the best of Indian civilizational thought and to express it in a contemporary idiom that is both persuasive and emancipator for young minds which have had no other nourishment than the one offered by an all-embracing, West-inspired globalization. In consequence, it has lost its own colour and character, and has borrowed polish from the carpenter’s shop… we have bought our spectacles at the expense of our eyesight. Like Tagore, Ramakrishna Rao, too, is concerned that we are in danger of losing our priceless inheritance and in trying to replace it clumsily with feeble imitations of the West, we are making ourselves superfluous and ludicrous. Such a fate may not be looked at with equanimity. In a globalized world that links not only entertainment and capital flows but also ideas, the bankruptcy of Indian thought will also have an impact on Western mind, make it poorer. To adapt Tagore’s words, if the great light of culture becomes extinct in the East, the horizon in the West will mourn in darkness. Prof. Rao’s is not a defensive and regressive repudiation of Western sciences of man, some kind of fundamentalist response. What he objects to is the disproportional space Western ideas and world-view continue to occupy in the modern Indian mind. This colonialization has killed or hampered the opportunity to create a new combination of truths that could arise if we were also aware of the hidden riches in our own tradition. What he urges is the mining of psychological truths in the Indian tradition, its revival and strengthening, not to resist in opposition to the Western tradition but to become its true partner. Otherwise, psychologists in India will continue to live, as they have done for a century, on the outskirts of modern West (in Tagore’s words) “as the hewers of texts and drawers of book learning”. It is at our peril if we do not heed the voice of a rare, visionary thinker. This volume is a review and appraisal of the sixty-year academic journey of Prof. K. Ramakrishna Rao covering many areas including Indian psychology, yoga, parapsychology, consciousness and Gandhian studies by a select group of international experts fully conversant with Prof. Rao’s work. The book shows not only the contributions of Prof. Rao in advancing the frontiers of Gandhian and consciousness studies and bridging the East-West divide in these areas but also his intellectual influence among a number of scholars around the world. 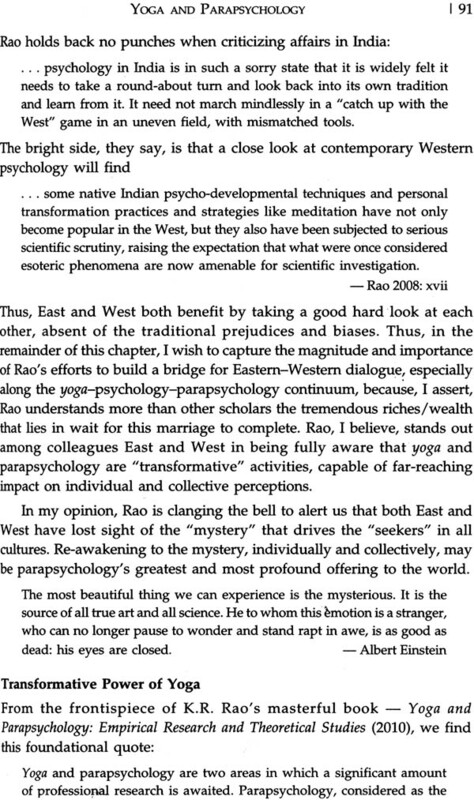 From Prof. Rao’s perspective, parapsychology, Indian psychology and yoga fall under the general rubric of consciousness studies. 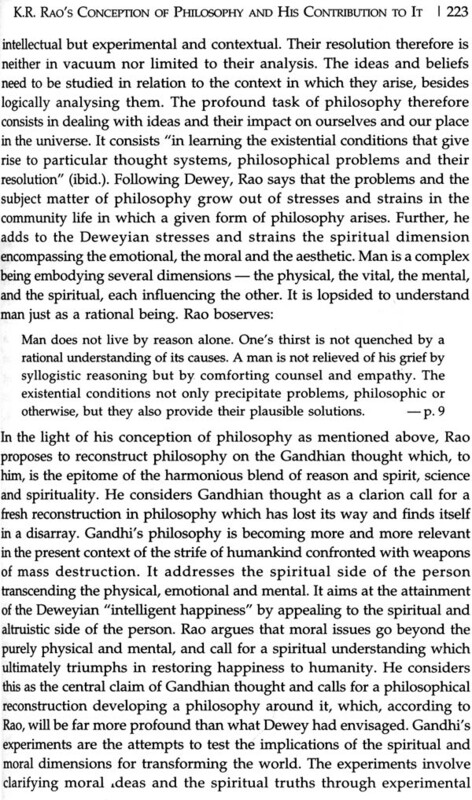 Further, according to Prof. Rao, Gandhian thought and practices are best understood against the backdrop of researches in the broad area of consciousness. Hence the title of the book Consciousness, Gandhi and Yoga. Prof. Rao’s East-West journey started at the very beginning of his research career. He did his MA (Hons.) dissertation on paranormal cognition, discussing Western research and Indian theories. This was published under the title Psi Cognition (Rao 1957) with Foreword by J.B. Rhine, the father of experimental parapsychology. This was followed by his book Gandhi and Pragmatism: An Intercultural Study (Rao 1968). This cross-cultural journey in areas as diverse as paranormal phenomena and Gandhian studies has never stopped. It has been continuous and relentless, eventhough Prof. Rao shouldered numerous other responsibilities. The milestones of his journey are the following other publications. He edited a volume Cultivating Consciousness: Enhancing Human Potentials, Wellness and Healing (Rao 1993). An expanded and revised edition of this volume is being published in 2013 by D.K. Printworld. Consciousness Studies: Cross Cultural Perspectives was published by Jefferson, McFarland, USA (Rao 2002). 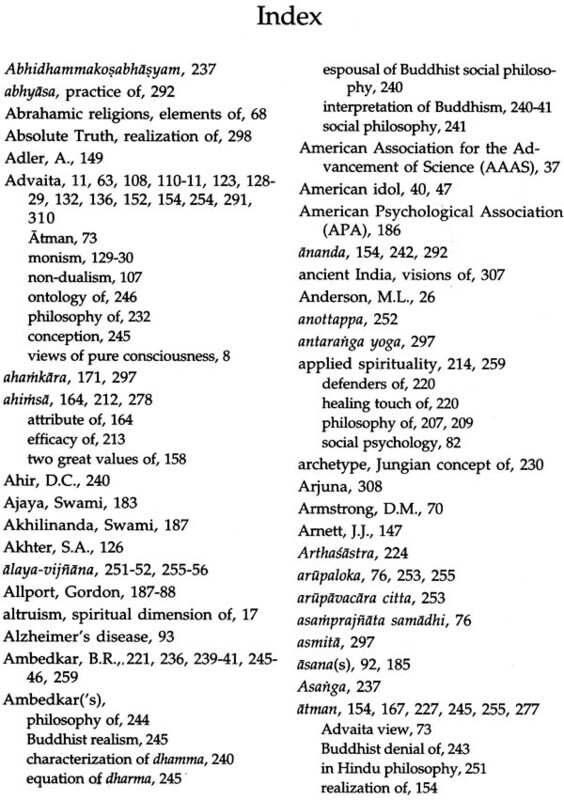 The more recent ones are Cognitive Anomalies, Consciousness and Yoga (Rao 2011a) and Gandhi and Applied Spirituality (Rao 2011b). Thus Prof. Rao’s academic voyage is truly an East-West odyssey and an important interdisciplinary exercise. 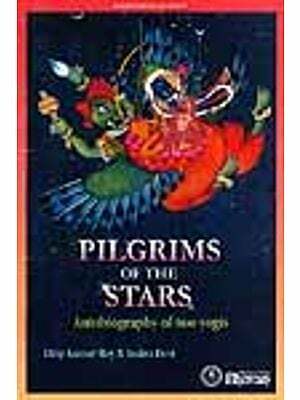 He has not only travelled back and forth from continent to continent and held important academic assignments in USA and India, but he also attempted to understand their unique cultural nuances for gaining wholesome insights into human nature. Koneru Ramakrishna Rao began his professional career as a lecturer in the Department of Philosophy at Andhra University sixty years ago. By then he studied Indian philosophy and Western philosophy under the tutelage of Prof. Saileswar Sen and Prof. Satchidananda Murty, respectively. He was also exposed to psychology as pursued in the West at that time. Prof. A. Lakshmana Rao taught psychology in the philosophy department at Andhra University during those days. The formative field of exploration of young Ramakrishna Rao may be seen as a matrix of Indian thought and Western philosophy and psychology. His endeavour since has been one of seeing patterns in this matrix and create a mosaic where the three can be seen coexisting in harmony, complementing each other for a complete and consummate understanding of man and his destiny. There is another interesting aspect in Prof. Rao’s academic journey. He has not been content with acquiring knowledge. He has been equally interested in exploring the ways of applying knowledge for common good of human kind. This exercise is one of converting knowledge into wisdom. He considers wisdom as knowledge applied to life. 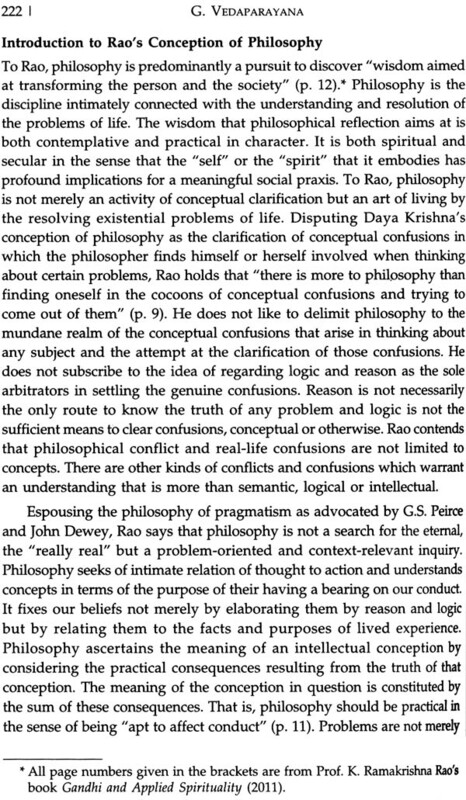 Thus we find in Prof. Rao’s sixty-years academic odyssey a relentless pursuit of wisdom. This he has attempted to do by churning the East-West ocean of knowledge; and it was no small undertaking. Many in the past found it a daunting and challenging task as the contours of East-West knowledgescape appeared so desperately different and tortuously troubling to reconcile. It is for the readers of this volume to find the extent of Prof. Rao’s success in bringing the East and the West together. The assessments are likely to vary; but few would fail to be impressed by his Herculean scholarly effort, his encyclopaedic knowledge, the commendable command on ideas and clear insights into the nuances of both the traditions, East and West. What is even more amazing is that he is as active and productive at the age of eighty as he ever was. 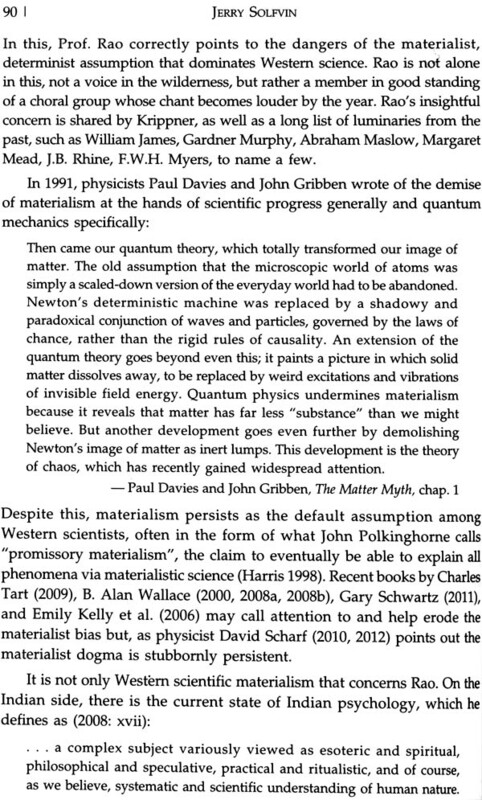 His is one of the very few mature, active and encyclopaedic minds I encountered in my own fairly long academic career. 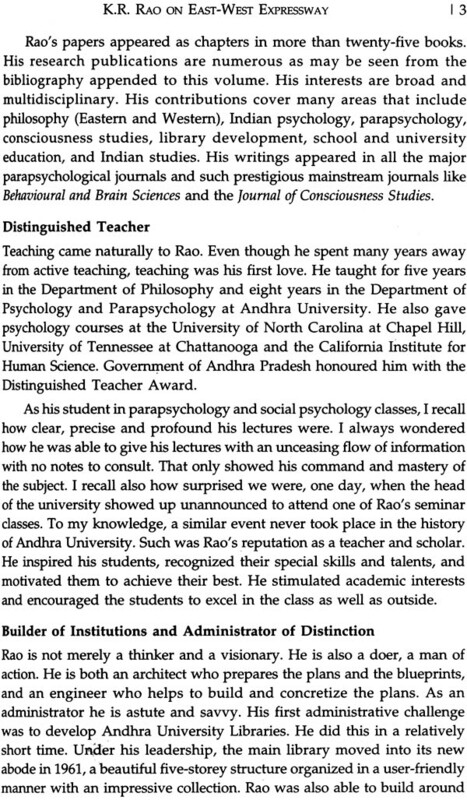 Over and above his excellent academic work, Prof. Rao occupied several prestigious administrative positions. He was the Chairman, Indian Council of Philosophical Research (ICPR), New Delhi, for two terms, and the Vice-Chancellor of Andhra University, Advisor to Andhra Pradesh State Government on Higher Education, Vice-Chairman of Andhra Pradesh Planning Board, and the Chair of Several national and state-level committees. Consequently he is well known beyond the academic institutions where he worked. I consider it a great privilege to have the opportunity to put together this collection of essays reviewing his academic work by some eminent scholars fully familiar with Prof. Rao’s writings. We offer it as a small token of academic tribute to his outstanding scholarship and creative contributions. The contributors to his volume are an interesting mix of scholars with different cultureal and academic backgrounds. Prof. Anand Paranjpe, Dr Kanthamani and Dr Hanu Rao are Indians who worked most of their professional lives in the West. 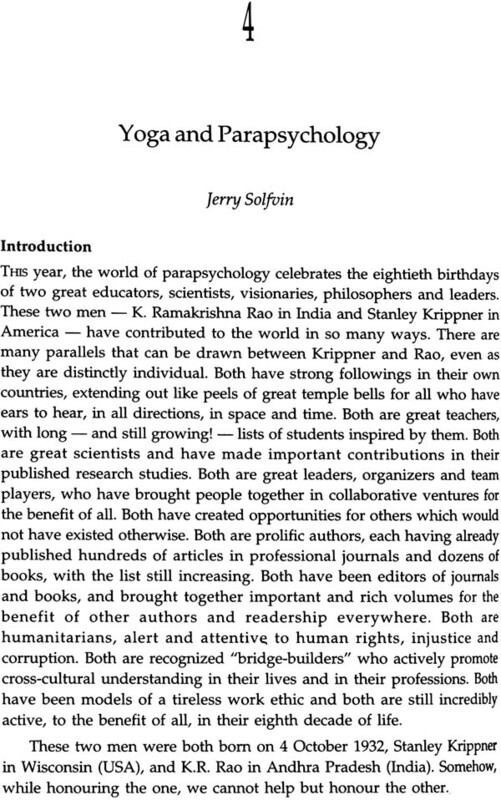 Dr Jerry solfvin is an American with a deep interest in India and Indian philosophy. Prof. V.V. Raman is a distinguished physicist and philosopher with Indian roots and Western upbringing. Prof. Max Velmans is a leading Western researcher in consciousness studies. Prof. R.C. 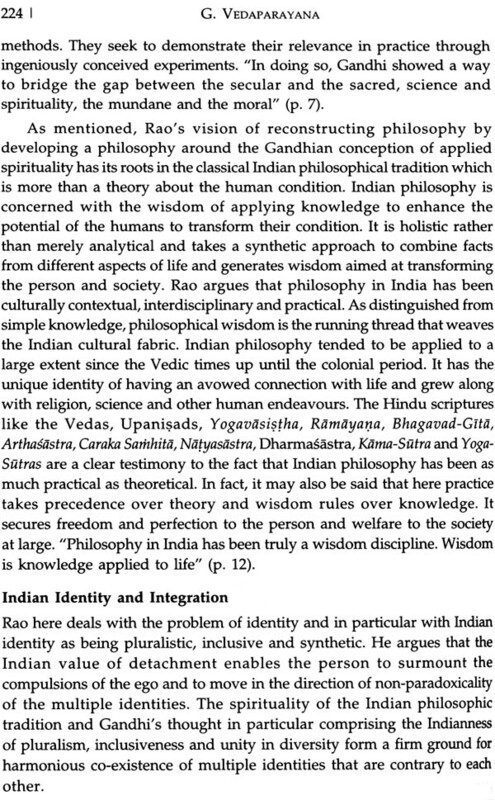 Pradhan, Ashok Vohra and G. Vedaparayana are among the leading Indian philosophers familiar with Prof. Rao’s work. While Dr Alok Tandon is an interested outside scholar, Prof. Gouri Rammohan is a former student and later a colleague of Prof. Ramakrishna Rao like Dr Kanthamani and Hanu Rao. Dr Matthijs Cornelissen is a Dutch psychiatrist settled in India. He is a scholar of Sri Aurobindo and is a close associate of Prof. Rao in the Indian psychology movement. Prof. Devadoss, one of the senior philosophers in the country, has known Prof. Ramakrishna Rao for almost forty years and they have had opportunities to work together on a number of occasions. Prof. Girishwar Mishra and Prof. Janak Pandey are distinguished psychologists and long-time friends and associates of Prof. Rao in promoting Indian psychology. Prof. Ajit K. Dalal of Allahabad University and Prof. Jean Kristeller of Indiana State University, USA, are well-known psychologists located in two continents divided by long distance and huge cultural differences. They, however, illustrate how the work of Prof. Ramakrishna Rao touched and influenced them in interesting ways. We thank Dr Karan Singh, the best-known philosopher-statesman of the country after Dr Sarvepalli Radhakrishnan for his message. Dr Karan Singh is fully acquainted with Prof. Ramakrishna Rao at a personal level and is familiar with Prof. Rao’s academic contributions. We are equally privileged to have the Foreword from Dr Sudhir Kakar, a well-known Indian psychoanalyst, psychologist and a respected author. I am grateful to all the above for readily agreeing to contribute to this volume and timely delivery of their articles. I know well that all the contributors of this volume responded so spontaneously to my request for papers because of their deep respect, love and admiration for Prof. Rao and his work. 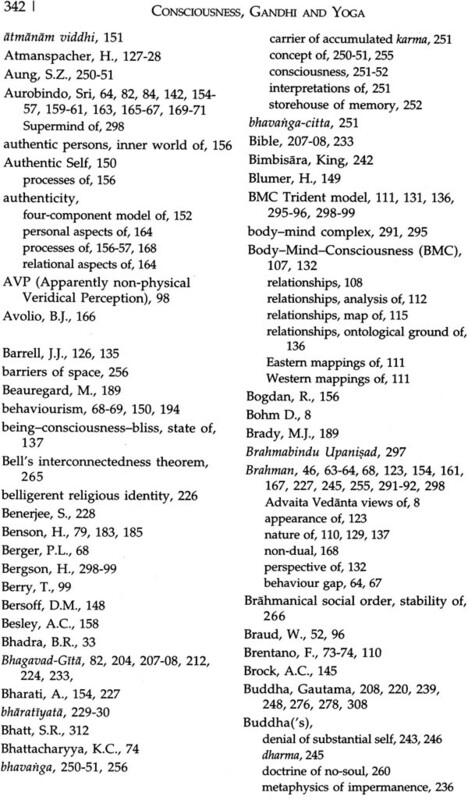 In this connection, I may call attention to a sister-Volume Mind and Consciousness, edited by Prof. K.R. 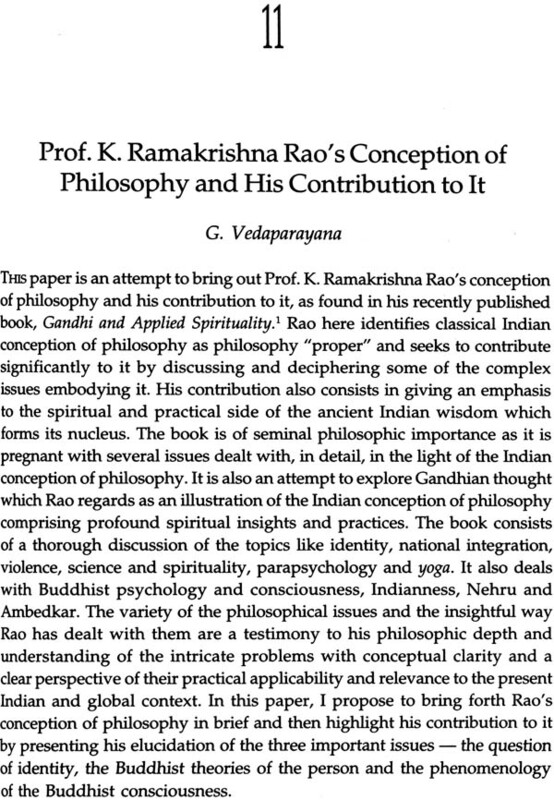 Rajani, which contains a number of articles reviewing the work of Prof. Ramakrishna Rao. I thank Mr Susheel K. Mittal of D.K. Printworld, for readily accepting to publish this book and for the splendid job of bringing out an aesthetically appealing volume and to GITAM University Press for including this volume in their scholarly book series. 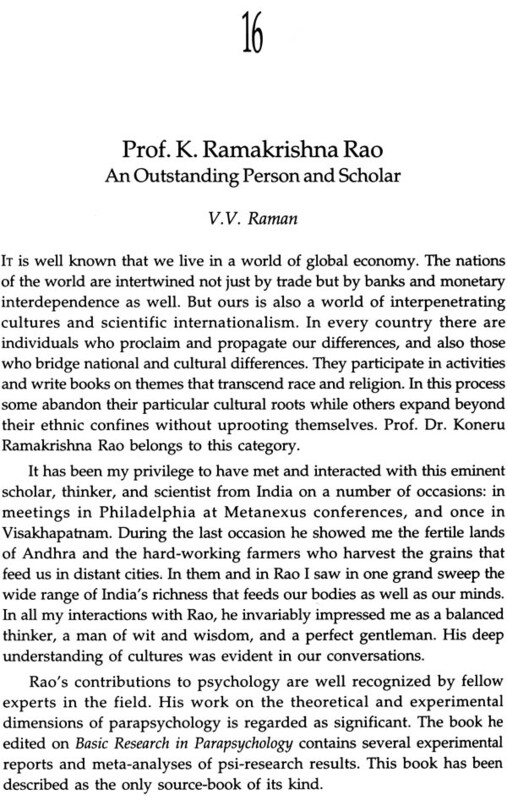 I also express my thanks to the family of Prof. Ramakrishna Rao for sharing the photographs printed in this volume. I am thankful to Dr Nalini Bikkina, Dr M. Varalakshmi and Dr Aruna Pariti for their help in reading the proofs and other editorial assistance. It is customary in this part of the world to celebrate two events in one’s life. The first is the completion of sixty years, which is called sastipurti. The second is the rising of one thousand full moons after one’s birth. This happens after one reaches the age of eighty years. We are indeed very happy that in a way the two events in this case are coalescing into one in a very interesting way. Prof. Koneru Ramakrishna Rao completes sixty years as an academician having started his professional career as a lecturer at Andhra University on 12 August 1953. So, this is the year of Prof. Rao’s academic sastipurti (sixtieth anniversary). Again, Prof. Ramakrishna Rao sees during this year 1000th full moon since his birth on 4 October 1932, the sahasracandrodaya for him. I take this opportunity to say on behalf of the contributors to this volume, and many of Prof. Ramakrishna Rao’s students, colleagues, friends and admirers, “Happy Sastipurti and Happy Sahasracandrodaya”. May the Almighty shower His Choicest Blessings on him and his family for many more years of excellent health, active scholarly work and continued success in the advancement of human science and service!